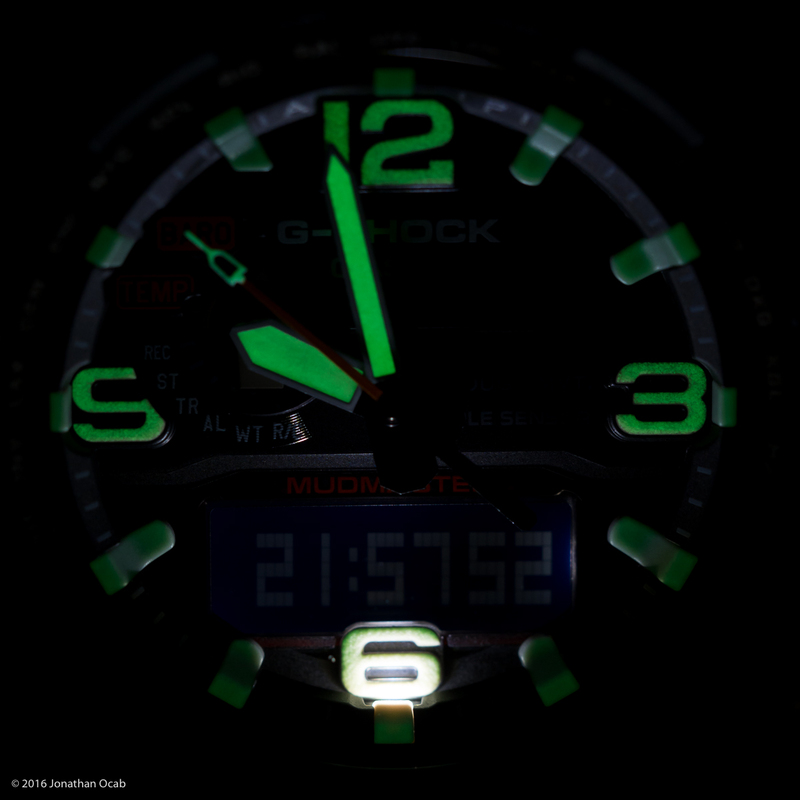 The Casio G-Shock GWG-1000 Mudmaster has been out for well over a year, first released in roughly September 2015 in three versions: GWG-1000-1A (all black), GWG-1000-1A3 (black with OD green strap), and GWG-1000-1A9 (black with yellow strap). But more variations have made it to the public since the initial versions came out last year including the GWG-1000GB-1A (black with gold trim) and the GWG-1000RD-4A (black with red strap and blue bezel ring). 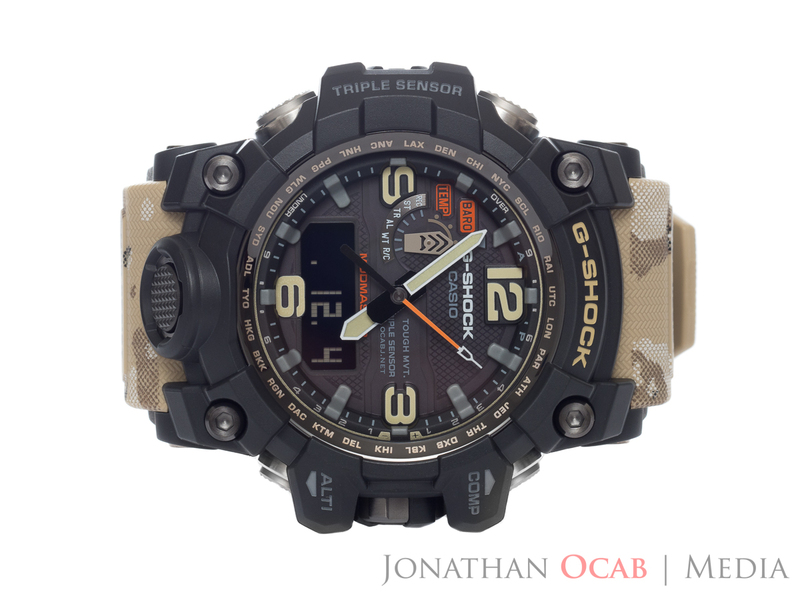 Recently, another variation of the GWG-1000 Mudmaster has been trickling out to retail stores: the GWG-1000DC-1A5. While I was at a local Macy’s department store a couple weekends ago shopping for gifts, I passed by the watch counter and noticed that they had a single GWG-1000 Mudmaster among all of the GG-1000 Mudmaster watches (GG-1000 is a Mudmaster with only Twin Sensor and lacks Tough Solar technology). 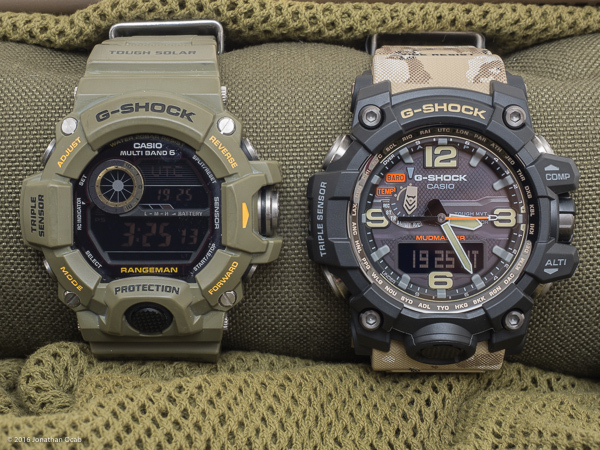 On closer inspection, I saw that the GWG-1000 in the display case was the new 1000DC-1A5 variant with the Desert Camouflage strap. The GWG-1000DC-1A5 has the standard black case, but with a desert camouflage strap. This particular reference model has a dark grey dial with grey hour and minute markers. The text is a mix of white and grey, with orange to highlight the Mudmaster name and the temperature and barometric pressure functions as well as the second hand. After a few minutes of trying on the watch and pondering as I held it in my hands, I ended up purchasing it. Note: It took me a good ten minutes of thinking before I committed to the purchase. The GWG-1000 has a $750 MSRP, and the cost is actually why I had not acquired a GWG-1000 Mudmaster sooner. If the original MSRP were lower, perhaps $500, I would have probably bought the GWG-1000-1A3 (black with OD green strap) very close to when it was released. At the time the GWG-1000 was released, I already had the GW-9400 Rangeman for a couple years at that point, and the Rangeman was already a solid watch for hard use. So I took a pass on the Mudmaster. But new color way, the fact that it was fairly new to retailers, and because the Macy’s store was actually having a sale that included the G-Shock watches, helped encourage me to make the Mudmaster acquisition. There are other external details and accents that characterize the newer GWG-1000DC-1A5 reference model. 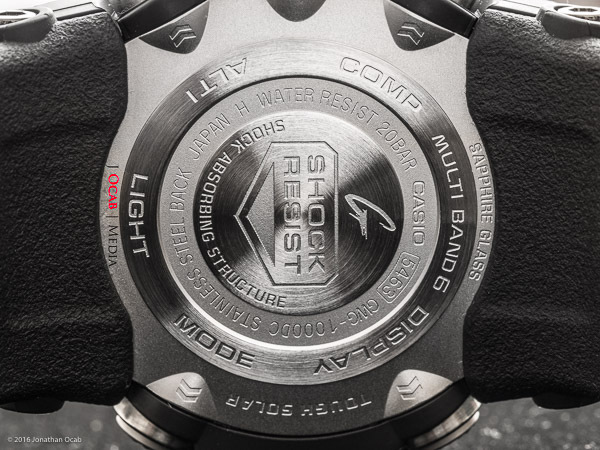 The text on outer bezel ring for the cities (world time) and the G-SHOCK text on the bezel are in a khaki color similar to the strap (not a bright gold or yellowish hue, or a dark brown hue). 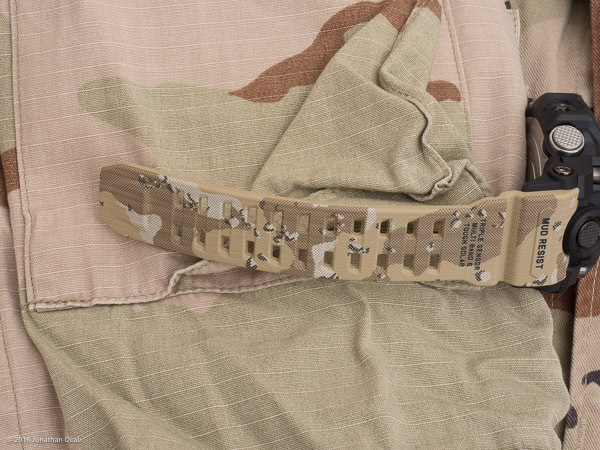 The desert camouflage strap is reminiscent of the six-color desert camouflage pattern (also known as the “chocolate-chip camouflage”) that was prominently used for the Battle Dress Uniforms worn by US forces in Operation Desert Shield / Desert Storm (Gulf War, 1990-91). 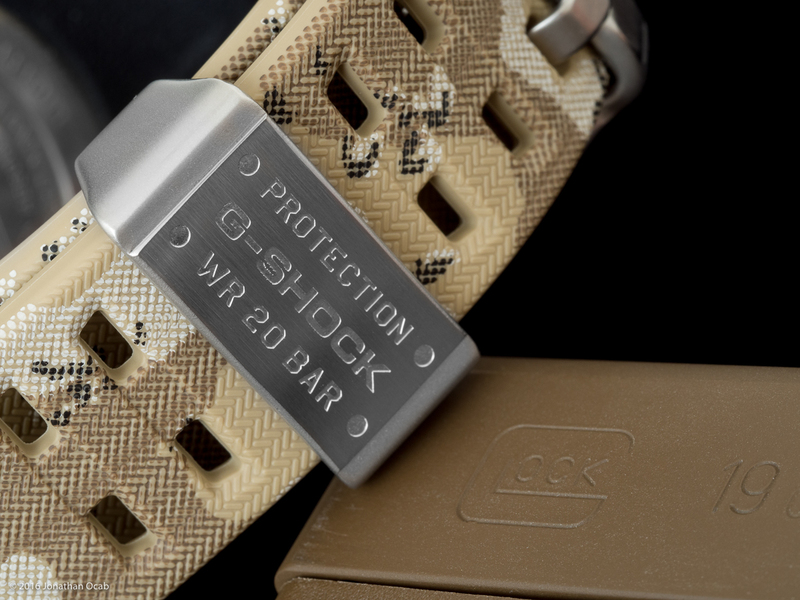 The strap hardware buckles are a brushed steel color. As far as the colorway of the GWG-1000DC-1A5, while I think the desert camouflage pattern works well for this Mudmaster variant, I do find it a mysterious choice on Casio’s part. As I said before, the pattern looks like the older-style six-color desert camouflage pattern that hasn’t been in service for over twenty years. Author’s father’s six-color desert camouflage BDU (aka “Chocolate-Chip Camouflage”) from Gulf Theatre (circa 1990-91). 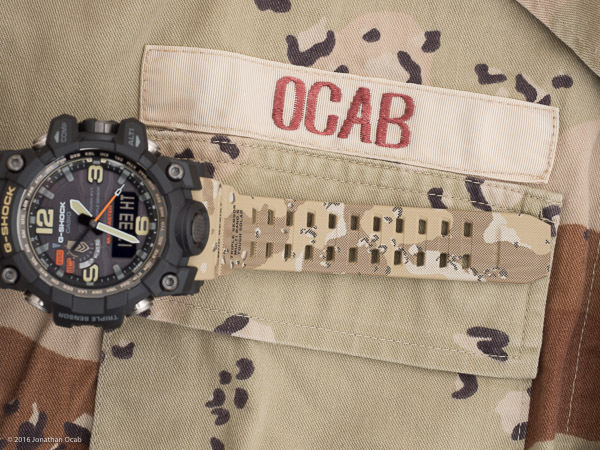 Casio could have instead used the more recent three-color desert camouflage pattern (sometimes referred to as the “coffee stain camouflage”). Author’s father’s DCU (Desert Camouflage Uniform) with three-color desert pattern post-Gulf War. I am guessing the “pink sand” color used in three-color desert camo may not look very attractive or aesthetically pleasing on a watch strap. 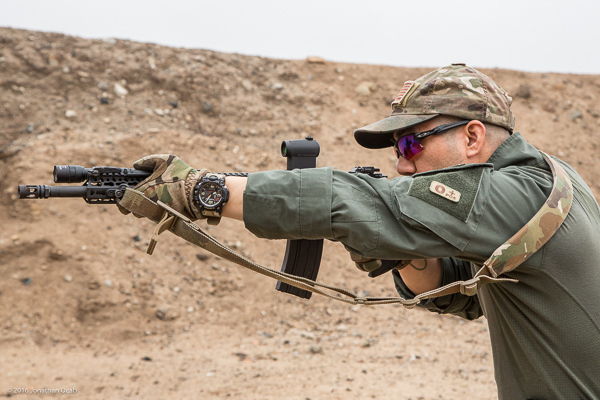 The strap pattern aside, I think the overall look of the desert camouflage strap and the black case looks well done, but I think the strap buckle hardware should have been black. To do this with any sort of longevity on the finish, it most likely would need to be anodized steel, and I don’t think they would have invested the time and money to produce the buckle hardware in that manner. Painting the hardware black would have been worse than just the brushed steel appearance. From this point on, my discussion of the watch will make a few references to the Casio G-Shock GW-9400 Rangeman, which I also own and still use heavily for field use. 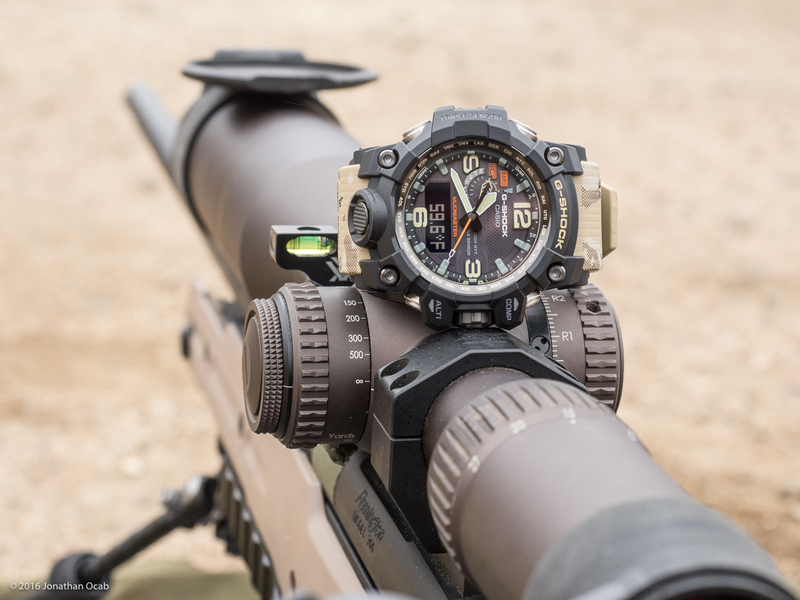 Beyond the colorway of the watch, the GWG-1000 Mudmaster series is an analog and digital hybrid (unlike the GW-9400 Rangeman which is digital only). The analog feature does several things for this watch. For one, it simply serves as another way to read the time off the watch. For some, the analog hands allows for easier glancing of the dial for the time. It also helps to make it easier to read in low light conditions due to the fact that the hands and the hour markers are luminous. 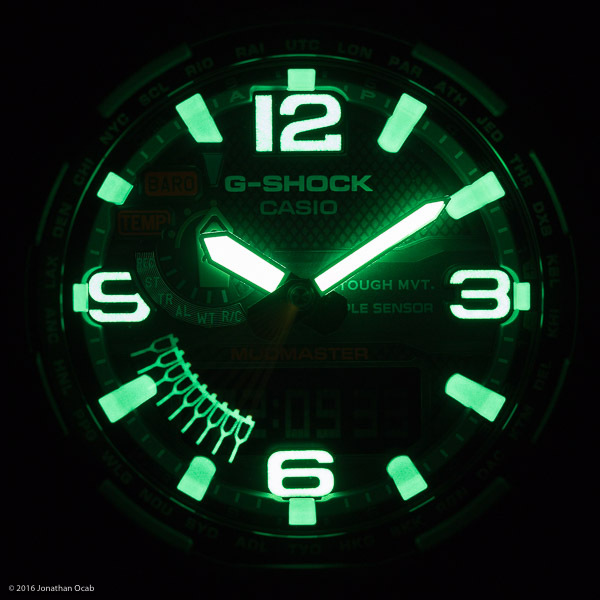 Casio does not cite the luminous phosphorescent paint used on this watch in their product spec sheet, but it is green in color. 8sec exposure, f/4, ISO 200. Disclaimer: The lume brightness in the photos were enhanced for artistic purposes, specifically by utilizing a high lumen output flashlight to charge the lume and long exposure and high ISO. 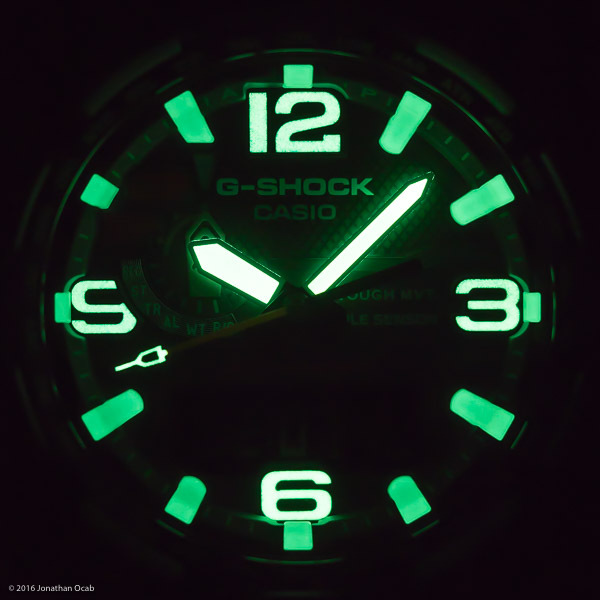 If for some reason the lume markers are not bright enough (faded after lack of exposure to light), you can use the button below the dial to light up the digital LCD to read the time. The analog / digital functionality also allows for easier dual-time referencing. For example, the primary method of reading two time zones is to have the “home time” (local time) on the digital LCD and the second time zone on the analog hands. I have mine setup with local time (Pacific Time) on the LCD and UTC on the analog hands. The analog movement actually adds a fourth hand beyond the standard three hand complication (hour, minute, second). The fourth hand serves as an indicator of the watch mode that is currently selected. 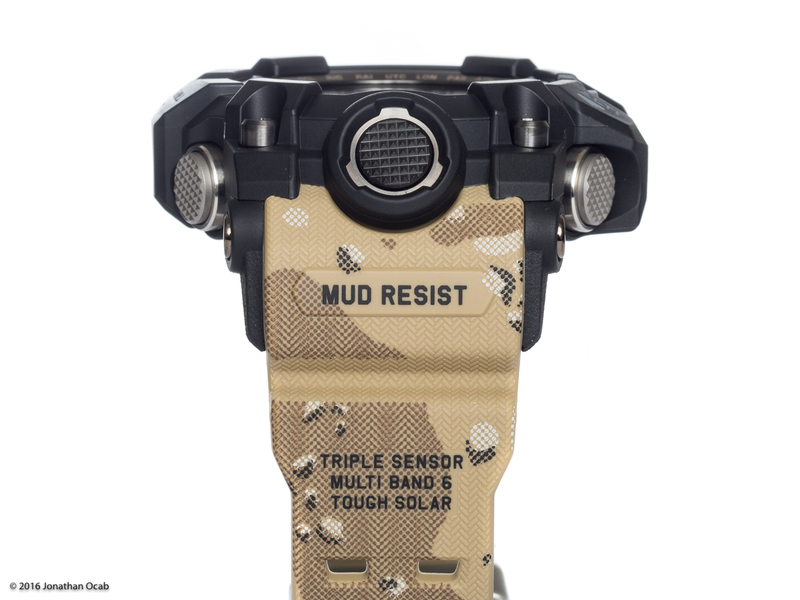 This is very useful in a watch with so many functions like the Mudmaster and Rangeman. Yet the nuance with the Rangeman is that you have to remember what function follows the current on you are on as you press the function button to switch modes. Sometimes you press too fast after you get to the mode you want, and end up having to cycle through the modes again to get back to the function you wanted. But with the mode indicator hand, you can easily see what mode you’re in and visually track the modes, specifically the next mode in the sequence, as you step through with the mode button. That being said, the GWG-1000 Mudmaster has a very similar feature set to the GW-9400 Rangeman. So what sets these two watches apart? Aside from the obvious analog+digital vs digital-only aspect, the GWG-1000 Mudmaster is a beast compared to the GW-9400 Rangeman. The Mudmaster is 59.5 x 56.1 x 18.0mm at 119 grams, compared to the 55.2 x 53.5 x 18.2mm at 93 grams of the Rangeman. The Mudmaster actually has an added vibration resistance specification, over that of the Rangeman, due to the use of “Alpha Gel” technology. Alpha Gel is a material that Casio used to cushion the movement inside the case, to add even more shock protection to the watch. A surprising feature of the GWG-1000 Mudmaster is the use of a sapphire crystal as opposed to mineral glass like on the Rangeman or acrylic crystal on their lesser models. Sapphire crystal is very scratch resistant, but is not very impact resistant compared to mineral glass or acrylic crystal. Acrylic is more impact resistant, but far less scratch resistant. Mineral glass is slotted in-between sapphire and acrylic, in terms of being moderately impact resistant and moderately scratch resistant (comparatively speaking). Considering the amount of shock resistance they engineered into the Mudmaster, I figure the use of mineral glass for the crystal would have been appropriate. Although, one of my main concerns with non-sapphire crystals is scratching the crystal itself, so having a sapphire crystal on the Mudmaster is a plus for me. 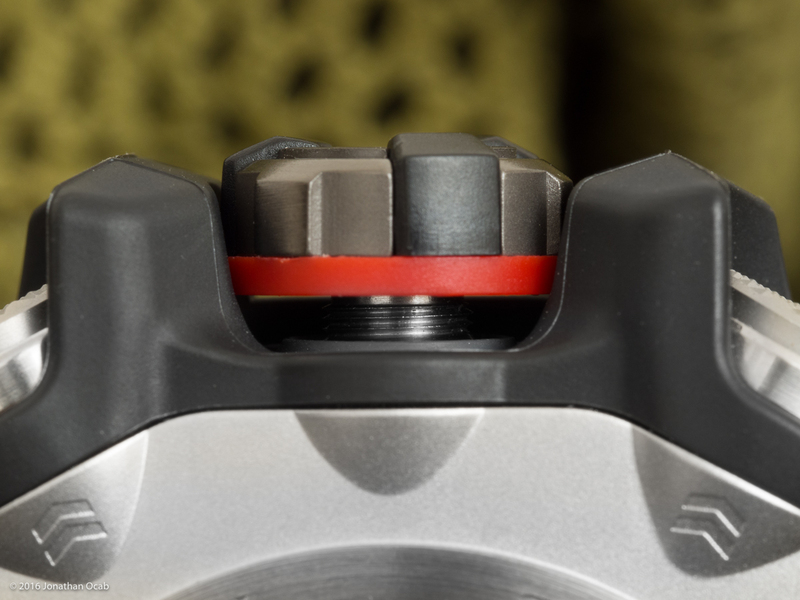 The Mudmaster also has a crown, by virtue of the analog function of the watch. The crown is screw down, and is utilized to adjust settings on the watch. The GWG-1000 Mudmaster does lack the sunrise/sunset capabilities that are found in the Rangeman, which I actually find useful. 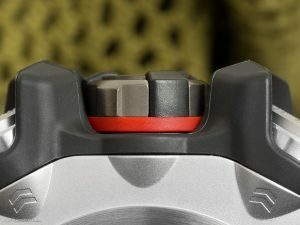 The Rangeman is actually faster to retrieve the Triple Sensor data due to the sensor button on the 3 o’clock side of the watch case, while the Mudmaster requires you to utilize the mode button (lower left button on the case) to cycle through the modes to get to the given sensor function. While this is slower, it actually helps prevent accidental sensor readings. 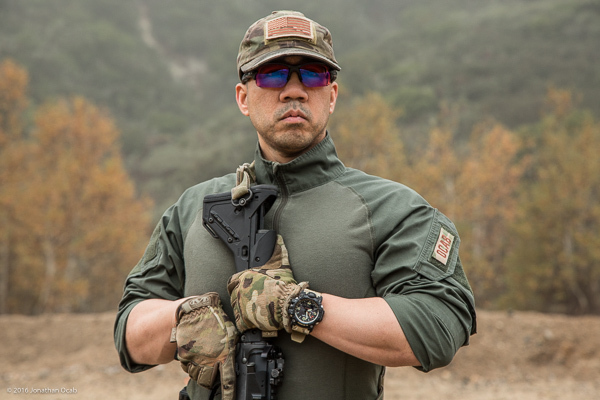 With the Rangeman, I have accidentally actuated the quick sensor button when I contort my hand while gripping a rifle, specifically while wearing gloves (glove material bunches up and puts pressure on sensor button). As far as wearability, the Mudmaster is going to definitely be quite prominent on the wrist. But this isn’t something you wear to the office. This is a watch you wear when you’re going to be in harsh and rough environments, and can’t worry about babying your gear. Of course, I will often wear my Rangeman over my shirt or jacket sleeve as applicable. While not stylish, it is a functional method of wearing a watch, particularly in cold and/or wet weather conditions. Fortunately, there is plenty of strap length for wearing the watch over the sleeve, even with a thicker jacket, assuming you have medium to small wrist diameters. All in all, I find the Casio G-Shock GWG-1000DC-1A5 Mudmaster to be a fantastic watch. 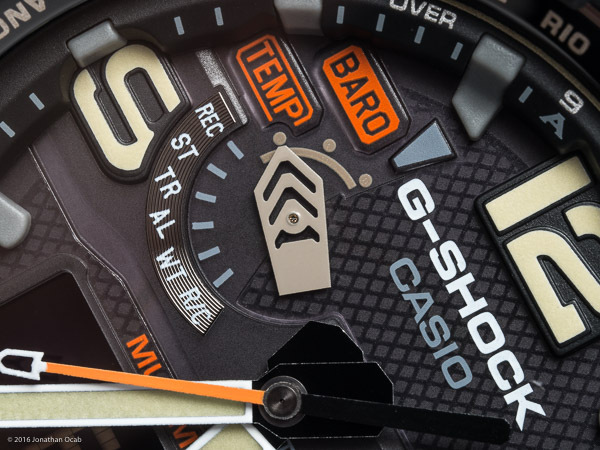 The GWG-1000 Mudmaster line in general is the embodiment of what the Casio G-Shock has to offer as far as technology, engineering, durability, and ruggedness. But this comes at a cost, and that cost is the $750 USD MSRP for the GWG-1000. Coincidentally, they had a 25% off sale that applied to the Casio G-Shock line when I was in the store that day and came across this GWG-1000DC-1A5, which made the purchase a little easier on the wallet. Granted, there are other ways to acquire Casio G-Shock watches (e.g. grey market, Japan import, etc), so you may be able to find this reference (or another GWG-1000 Mudmaster) for a far lower price (e.g. Amazon). If you are hesitant to spend $750 on a G-Shock, but like the features of the GWG-1000 Mudmaster, the GW-9400 Rangeman essentially has the same feature set, with minor differences, for less than half the price. I still think the Casio G-Shock GW-9400 Rangeman is an excellent G-Shock, and is a great buy as far as the “Master of G” line is concerned. 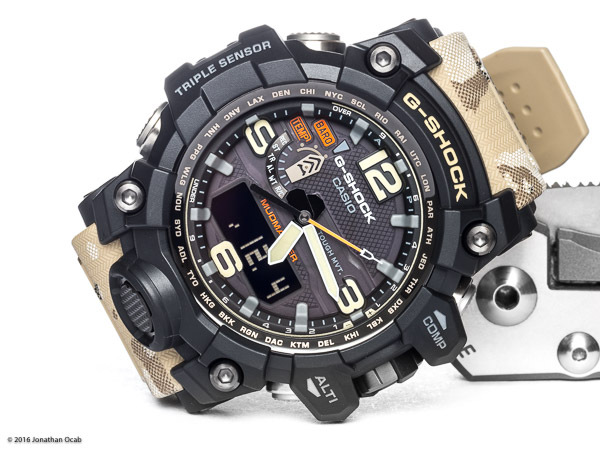 Anyway, I can give a solid recommendation for the Casio G-Shock GWG-1000 Mudmaster series, and especially the GWG-1000DC-1A5 in Desert Camouflage which I now have in my collection, and is now part of my watch rotation. For a video review, you can also view a recording that I posted on my YouTube channel. For another independent review, check out the GWG-1000-1A3 Mudmaster review on A Blog To Watch. Good review. Cool watch, but DAMN that price is nuts. Thanks. Forgot to mention great photos as well! very helpful review, thanks. helped me purchase one.